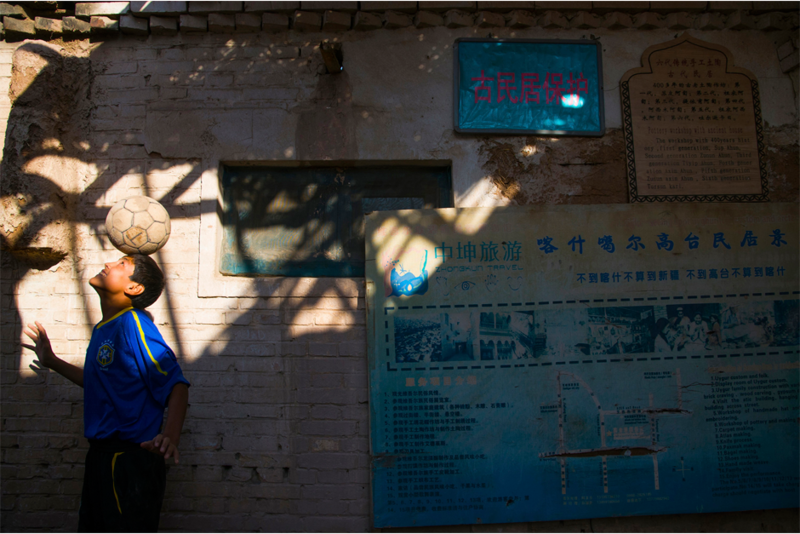 In the old city of Kashgar, a descendant of seven generations of Uighur potters balances a soccer ball in the alleyway in front of his house. 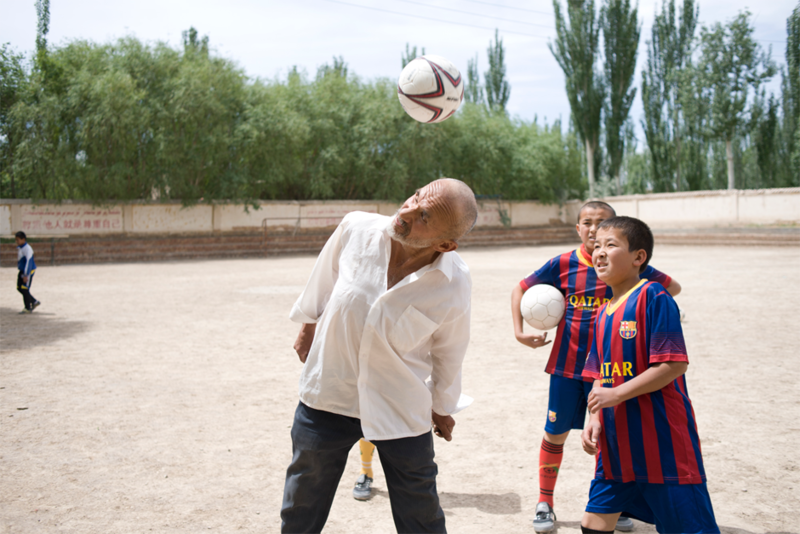 The “beautiful game” first came to Xinjiang province in the nineteenth century. 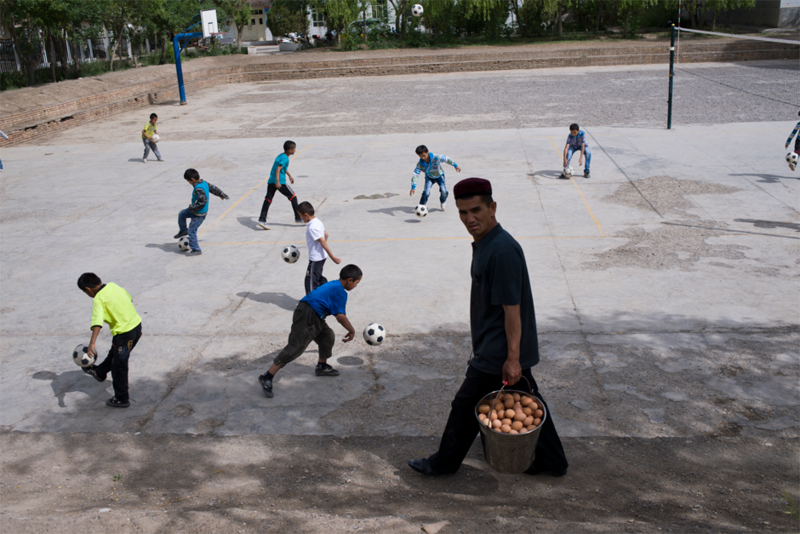 Tursun Qurban, 68, coaches soccer at Azak Township’s Central Elementary School, near Artux. When he was young, Tursun was an accomplished soccer and volleyball player. One of his greatest wishes is to someday visit Ergong Stadium in the provincial capital Urumqi to watch professional soccer. 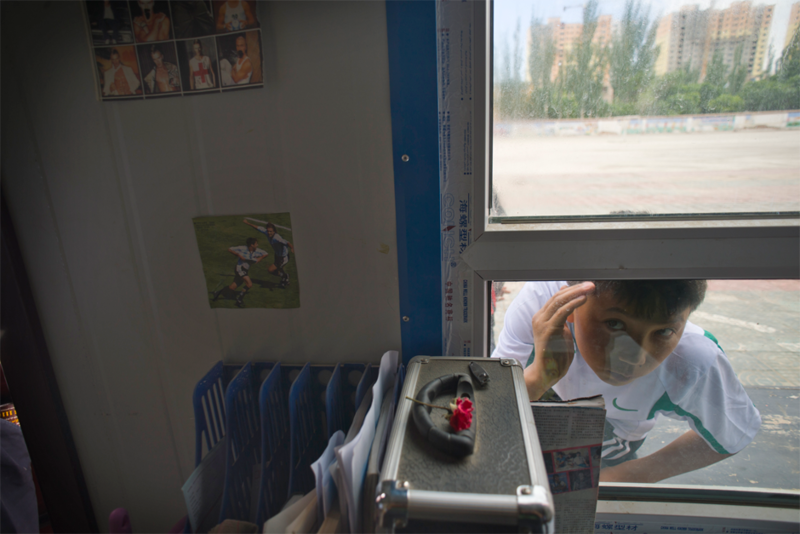 Dilmurat, who, like many Uighur goes by only one name, looks through a window while waiting for a friend. An outstanding goalie, Dilmurat has passed a qualifying test to the prestigious Evergrande Football School in Guangdong province, a requirement for acceptance. His father often drops by the school to watch him play. 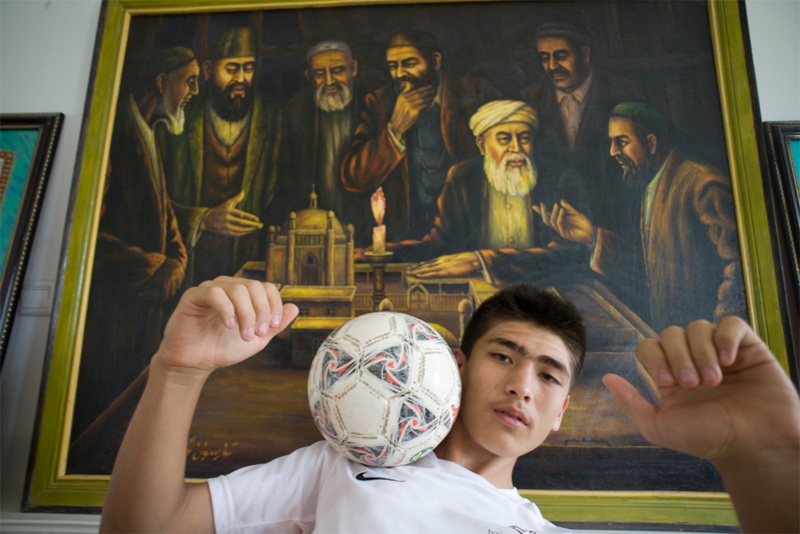 Imran, a young soccer player from Artux, poses in front of an oil painting in the school’s museum, which shows his ancestors debating the reform of traditional religious education. 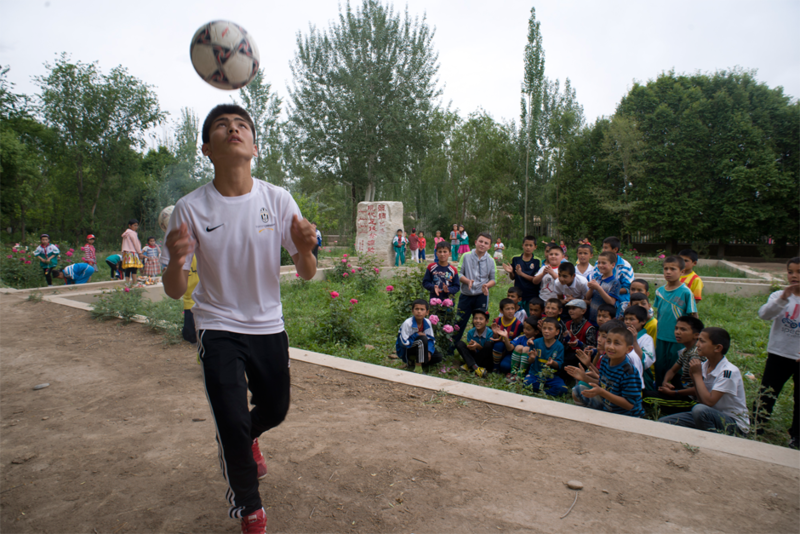 He recently spent a month in Italy training with the Juventus Football Club, and this is his first visit to Iksak, a place of great significance for Uighur soccer players. A child jumps the fence of a recreation area to play soccer in Ahu Township, near Artux. Coach Nasrulla Mijit says that Iksak and the surrounding areas are rich with promising players. Surveys show that Artux has produced far more professional athletes than many larger cities elsewhere in China. 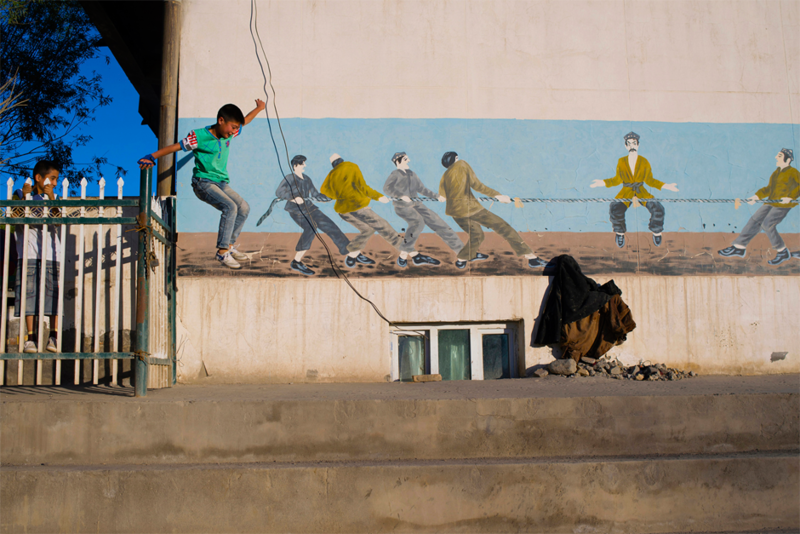 Elementary school children surround the statues of Hussein and Bawudun Musabayov, founding fathers of the town’s soccer tradition in Iksak, a town near the city of Artux. In 1874, the two brothers began an audacious plan to reform madrassa schools by incorporating elements of modern Western education, including training in soccer. Imran demonstrates soccer techniques for students in front of Iksak Elementary School’s soccer monument. 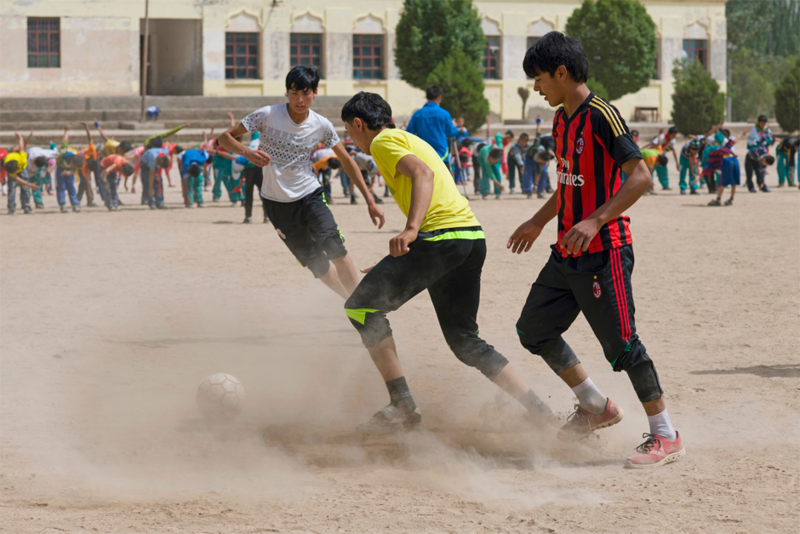 After 1885, when the Musabayov brothers founded the region’s first modern school, history, geography, and Farsi were added to the school’s curriculum, and soccer became a required course. 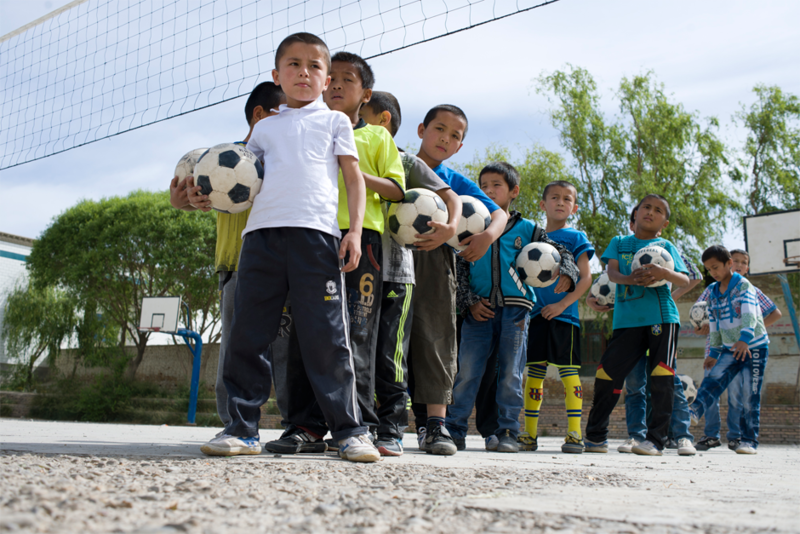 Young soccer players wait for their turn to practice at a rural elementary school near Artux. Club teams, more government funding, and targeted assistance from partner provinces and municipalities arranged by the central government could allow more talented soccer players to make it big. In the countryside surrounding Artux, there are almost no soccer fields with real turf, and there are few tournaments in which young people may participate. Rural elementary schools in the Artux area give each student a subsidy of ¥4 (about 65 cents) for lunch. The school provides meals of eggs, rice pilaf, and steamed buns. A hand-sewn sheepskin soccer ball commemorating the villagers’ victory over the British and Swedish teams in 1927 is on display in a museum at Iksak Elementary School. Coach Ekber, born and raised in a town with a rich soccer history, shares a photograph on his cellphone of his grandfather playing soccer when he was young. 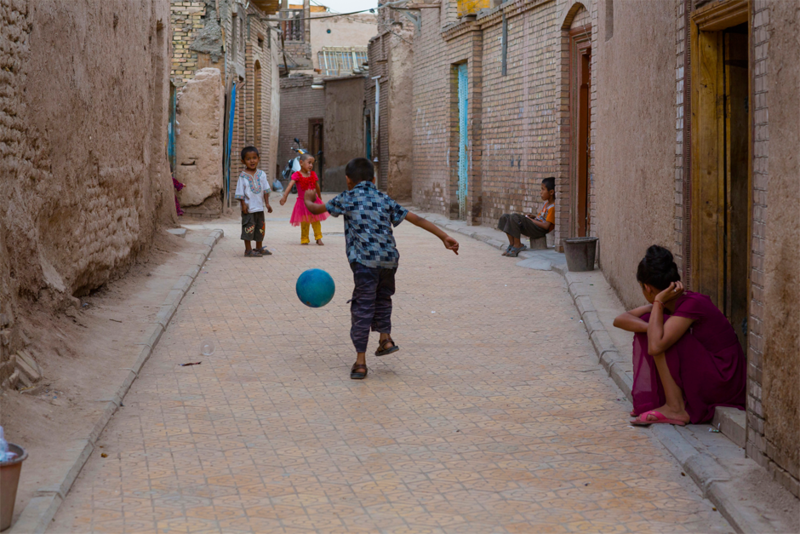 An alleyway in the old part of Kashgar, where soccer is one of the abiding passions of the city’s youth. In Memet Zunun’s courtyard, family members pick up mulberries that his grandson, Ekber, standing in the tree, has shaken loose. Ekber, a fourth-generation soccer maven, was a star player on an Artux team sponsored by local businessmen. Now he teaches physical education at Iksak Elementary School. 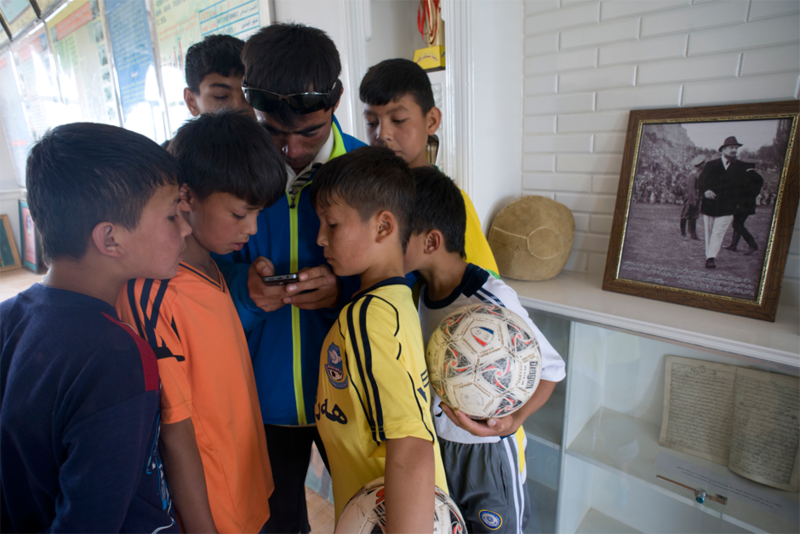 Guests at Memet Zunun’s house watch a documentary about soccer players from Urumqi’s Fifth Elementary School. 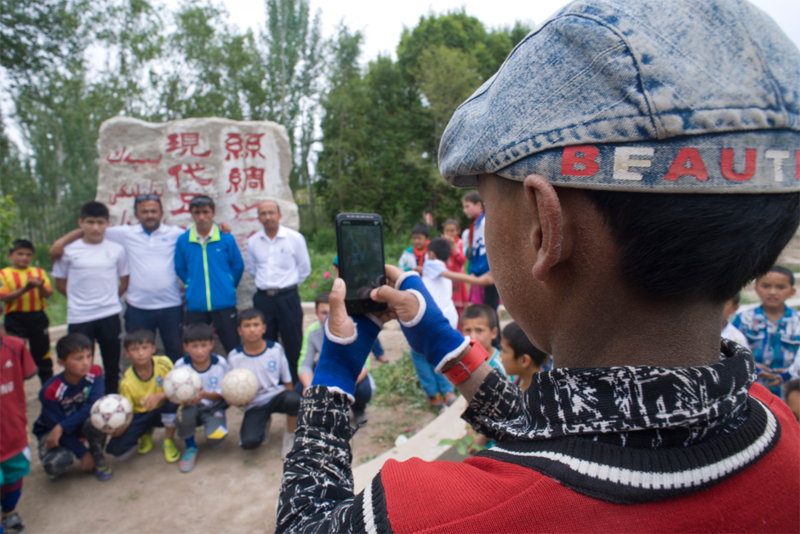 Zunun has 48 soccer-loving grandchildren, eleven of whom have played on professional teams. Imran visits his grandparents. His father was a successful boxer, wrestler, and soccer player. He nurtured his son’s athletic talents from an early age and dreams of his son becoming a real soccer star. 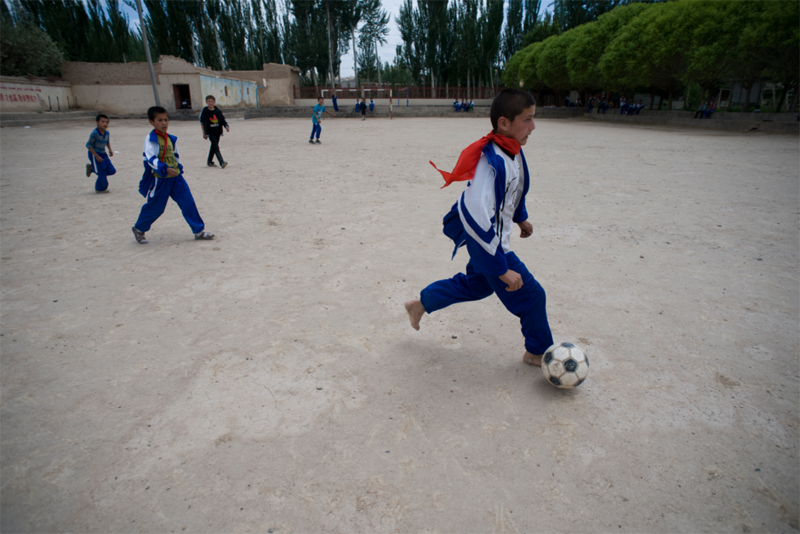 At an elementary school in Meyi Village, Azak Township, a student plays soccer barefoot on a dirt playing field. 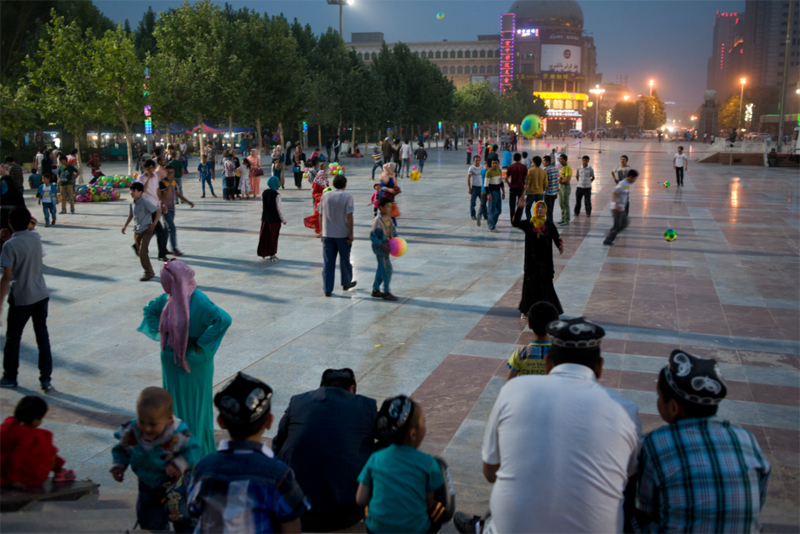 In the central plaza of Hotan city, people of all ages play soccer as dusk falls. 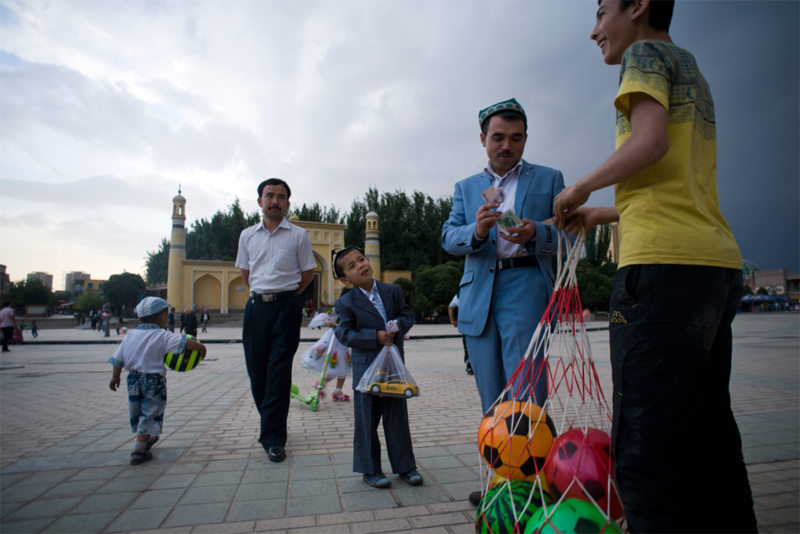 Every day on the plaza in front Kashgar’s Id Kah Mosque children play soccer and sell soccer balls. Nearly 150 years after the sport first came to Western China, soccer continues to be popular all along the former Silk Road. 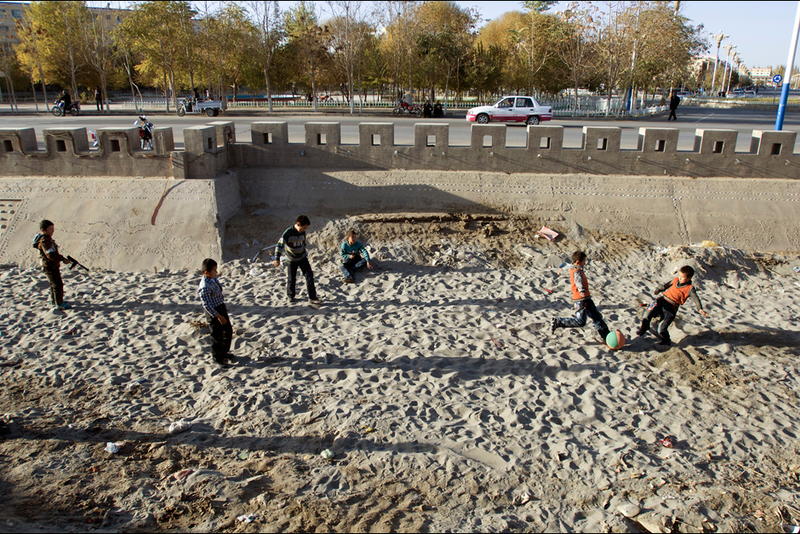 Even the dry bed of the Keriya River provides an excellent playing field for young soccer enthusiasts. 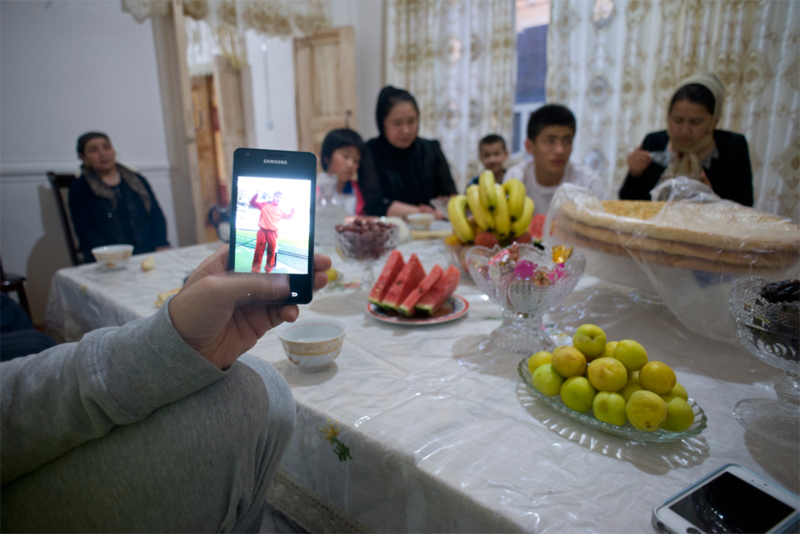 As the World Cup draws to a close, we present a photo essay by Chinese photographer Zhang Xinmin exploring the game of soccer along the Silk Road in Xinjiang, where it has a special place in Uighur education and culture. China’s forays into international soccer competition have been disappointing, at best. But, as Zhang explains below, a new generation of Uighur players traces its passion for the sport to forebears who played matches after evening prayers with hand-sewn sheepskin balls and, in celebrated contests in the 1920s, vanquished their European competitors. His photographs first appeared, last month, on the Chinese website Tencent. What follows are translated excerpts from Zhang’s introduction. It’s a clear, sunny day in Iksak, a small town surrounded by orchards outside the city of Artux in Xinjiang Uighur Autonomous Region. Iksak Elementary School’s 389 students are finishing up lunch in the noisy cafeteria. Afterward, many rush excitedly to the soccer field, where boys and girls alike vie for the ball, kicking up dust beneath the blazing sun. During the 10-minute interval between classes, children play ping-pong near the front entrance and tootle on wind instruments in the hallways; a few girls shimmy to music blaring out of a CD player. The kids on the field might just look like they’re blowing off steam. 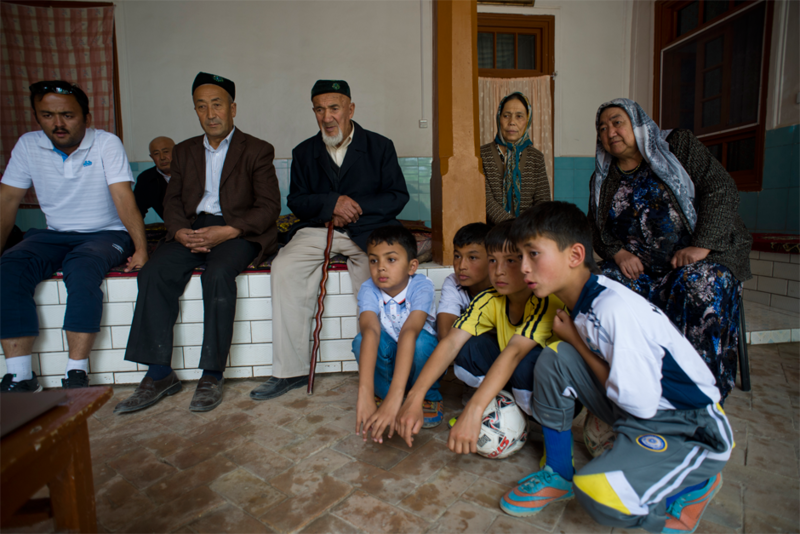 But there is a unique educational tradition here in the Uighur-majority prefecture of Kizilsu, Xinjiang—and soccer plays a central role in it. 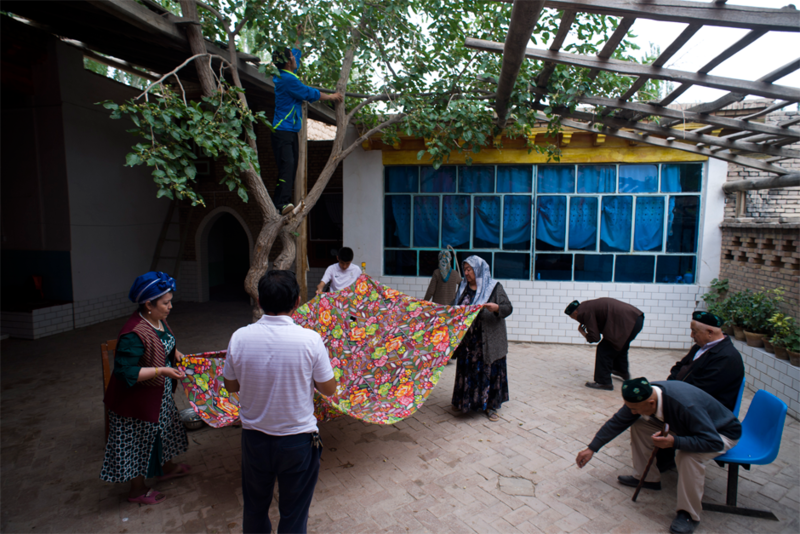 For the residents of Artux, Kizilsu’s crowded border city and once a key stopover on the Silk Road, trade and travel have always been an important part of life. During their travels, traders from Artux witnessed innovations in education and science abroad and began to found schools back home. In 1872 the brothers Hussein and Bawudun Musabayov devised a new curriculum for the madrassas of nearby Iksak, one that merged religious and scientific education. Soon, they sent observers to Europe to study soccer, and the sport became a requirement at their schools. In 1885, in a break with the conservative Islamic establishment, they founded a school focused on modern science, offered free education, and hired foreign instructors to teach subjects including medicine, fine arts, accounting, and Russian. The school featured a state-of-the-art soccer field. 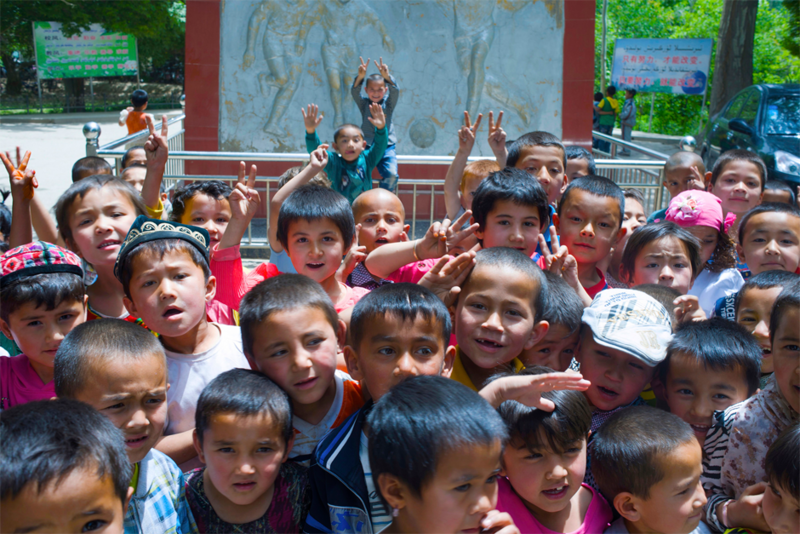 Graduates of its teacher-training program went on to teach throughout Xinjiang. Soccer training at the new school in Iksak was a hit, and soon the villagers, young and old alike, became passionate fans and players of the game. In May 1927, the British Consul in nearby Kashgar invited Iksak to send a team to play a match at the consulate. The British team members, all hailing from the sport’s birthplace, took it for granted that they would win and declared haughtily: “If you win the match, we’ll give you a stallion with a golden saddle.” To which Tursun, the captain of the Iksak team, replied that the villagers would give the British team two horses if they lost. In the end the motley team from Iksak, made up of farmers of all different ages, traveled to Kashgar in oxcarts and beat the British 2 to 1. They went on to a rousing victory over a group of Swedish missionaries, winning 7 to 0. One of the team’s members was the father of Memet Zunun, now 85, of Iksak. Memet remembers how when he was young, the Iksak villagers played with a real soccer ball only during matches. In practice they used homemade balls sewn from sheepskin. Before the Communist Revolution, every Friday after prayers, the villagers would gather at the soccer field, separate into three groups based on age, and face off against each other, young people and white-bearded oldsters alike playing soccer till sundown while the whole village watched.